This week, FirstEnergy Corp (NYSE: FE) announced the first electric utility dividend cut for 2014. Fortunately, it’s likely to be the last as well. The 34.5 percent reduction—effective with the March 1 payment—was right in line with the 33.3 percent I forecast in Conrad’s Utility Investor’s Endangered Dividends List. It was also widely expected, as the stock has dropped less than 5 percent since the news. Starting with 1990s deregulation, the US electricity industry has basically been a state-by-state story, rather than a national one. In 35 states, electric companies are still regulated monopolies, just as they’ve been for more than century. Prosperity depends on providing reliable service and maintaining cooperation from regulators, to ensure fair return on investment. In the remaining 15 states and the District of Columbia, electricity transmission and distribution are still monopolies. But in stark contrast, there’s competition between generators and marketers for sales. Revenue and earnings from regulated electricity operations is extremely steady in all environments, as sector companies proved once again during the 2007-09 economic crunch. Profits from unregulated, competitive businesses, however, depend on price and demand. And since mid-2008, wholesale power prices in deregulated Middle Atlantic states have dropped 45 percent. That’s in large part due to the fall in natural gas prices, on which power is effectively benchmarked. And it’s been very good news for purchasers of power, including the still-regulated transmission and distribution electric utilities. Power generators, however, have seen margins contract sharply. Pure producers such as Dynegy Inc (NYSE: DYN) were the first casualties. Expiring hedge positions and long-term contracts have forced them to sell output at declining margins on wholesale markets. One result is that sub-sector has rapidly consolidated. But even its strongest companies—Calpine Corp (NYSE: CPN) and NRG Energy (NYSE: NRG)—are themselves the product of previous bankruptcy filings. Starting last year, companies combining regulated and unregulated power operations also began to suffer. Last February, Exelon Corp (NYSE: EXC) axed its quarterly dividend from 52.5 cents to 31 cents a share. The stock’s negative 3.5 percent return was the worst in the Dow Jones Utility Average for 2013. FirstEnergy’s 6.5 percent loss similarly lags the DJUA’s 1.5 percent gain thus far in 2014. The good news is the reduced dividend level appears to be rock-solid. For one thing, less than 10 percent of 2014 earnings are projected to be from the affected wholesale generation business. The remaining $2.37 to $2.63 per share is from regulated utility operations and will cover the new dividend of 36 cents per share by at least a 1.65-to-1 margin (payout ratio 61 percent). Utility numbers also appear set on conservative assumptions for a range of issues, including Ohio restructuring and New Jersey rate matters pertaining to the Hurricane Sandy response. The company’s assumption of load growth is subdued at 0.6 percent, despite a surge in industrial sales from the ramp up of shale gas production in its Midwest service territory. Targets could be exceeded by successful smart meter deployment in Pennsylvania this year, as well as $4.2 to $4.6 billion in planned transmission system investment through 2016. The need to raise capital for the latter will be reduced by cash saved from the dividend cut, a development already acknowledged as credit positive by both Moody’s and S&P. As for the unregulated business, management is still downsizing, chiefly by closing older, less efficient coal power plants. It’s slashed projected capital expenditures by roughly $1 billion, focusing on extending the life of nuclear assets. These steps sharply limit exposure of FirstEnergy’s dividend and balance sheet to further downside in the wholesale power market. Historically in the utility business, post-dividend cut selling has marked the bottom for affected stocks. That should prove to be the case for FirstEnergy, despite a checkered nuclear plant safety history and regulatory uncertainty in Ohio. More important, however, odds are strong it will be the last regulated utility to cut dividends due to losses from the merchant power business. For one thing, only a tiny handful of companies still have meaningful operations in that business. And all of them have been feverishly reducing exposure. Of the Dow Jones Utility Average companies, Centerpoint Energy (NYSE: CNP), Consolidated Edison (NYSE: ED), NiSource (NYSE: NI), PG&E (NYSE: PCG) and Southern Company (NYSE: SO) have no merchant power activities in deregulated states. Neither will Edison International (NYSE: EIX), once it closes the sale of its bankrupt but ring-fenced Mission Energy operation to NRG Energy on or about March 31. Dominion Resources (NYSE: D) has slashed its merchant activity to a handful of nuclear facilities after disposing of its fossil fuels fleet. American Electric Power (NYSE: AEP) has cut exposure by transferring ownership of merchant plants to regulated utilities, most recently 1637 megawatts of capacity from an unregulated Ohio unit to regulated operations in West Virginia and Kentucky. 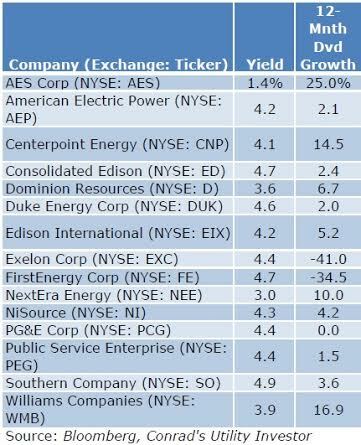 Once nearly half of revenue, Duke Energy’s (NYSE: DUK) unregulated commercial power business remains profitable. But it contributed little more than 1 percent of consolidated segment income last year. NextEra Energy’s (NYSE: NEE) non-utility income is almost entirely renewable energy under long-term contract, and largely immune from wholesale market pressures. And earnings from the regulated Florida utility alone cover its payout comfortably. Entergy Corp (NYSE: ETR) is the owner of the country’s second largest unregulated nuclear power fleet after Exelon. As such, some have highlighted the company as potentially the next regulated utility/wholesale producer to fall. This week, however, management squelched that talk with preliminary fourth quarter results that topped earlier guidance. The company also affirmed its 2014 forecast for operating earnings of $4.60 to $5.40 per share, enough to cover the current payout by at least a 1.39-to-1 margin (payout ratio 72 percent). The failure of a plan to spin off and merge power transmission operations with ITC Holdings (NYSE: ITC) did eliminate a potential upside catalyst for the stock. But management also cut risk from wholesale operations by reaching a deal with the state of Vermont to permanently shutter the Vermont Yankee nuclear plant. Entergy’s policy—in place since it first tried to spin off its unregulated power arm in the last decade—is to fund the dividend solely with utility earnings. And these are robust as ever, as the US Gulf Coast enjoys a petrochemicals renaissance. Public Service Enterprise Group’s (NYSE: PEG) dividend announcement next month will tell whether growth of regulated operations is really offsetting wholesale market weakness in New Jersey. Earnings per share dropped 15 percent from 2009 to 2012, as merchant profits have dropped. If the earnings release on February 20 shows management delivered on its expected 1 to 2 percent profit boost for 2013, we’ll see another increase. If not, it’s time to be a bit more cautious on PSEG. Ditto Exelon, which announces its fourth quarter results before the open on February 6. But if there is another dividend cut in the wholesale power business this year, the most likely candidate is Atlantic Power (TSX: ATP, NYSE: AT). It’s a small producer with a need to shepherd cash flow from its otherwise stable fleet of plants. That company will announce its fourth quarter and full year results after the market closes on February 27. It will also almost certainly release details on a promised plan to deal with balance sheet challenges. Conrad’s Utility Investor readers will receive details and analysis when available. Dividend cuts at Exelon and FirstEnergy have stirred worries about a longer-term challenge to the industry: Stagnant sales, made worse by companies’ efforts to ramp up capital spending to promote energy efficiency. At first glance, the numbers appear unsustainable: Typical annual US rate base growth of 5 percent when power demand is only rising 0 to 1 percent. Some forecast a future of rising customer discontent, accompanied by mass defections to distributed solar energy and rate case reversals as regulators balk at increases. That’s in part what’s transpired in Germany’s now dysfunctional power market. Both major utilities—E.On (Germany: EOAN, OTC: EONGY) and RWE (Germany: RWE, OTC: RWEOY)—have slashed dividends in half in the past year, as profits have plunged even as power prices have soared. High costs in turn have encouraged consumers and businesses to leave the grid, forcing closing of power plants and raising questions about system reliability. And strains will only get worse when utilities shut down their remaining nuclear plants early in the next decade. Sensing an impending train wreck, the Cabinet of the coalition government this week backed a plan to slash Germany’s renewable power subsidies starting in 2015. The government is also attempting to tackle the issue of paying utilities to provide backup power for those who leave the grid. Unfortunately for German utilities, those actions aren’t nearly aggressive enough to turn around their multi-year earnings decline any time soon. Worries about surging costs to industry if the US repeats Germany’s actions, however, are gaining traction in more than a few states. Arizona, for example, now charges a grid fee to rooftop solar users. We may be seeing the beginnings of German-ization of some states’ power markets—mainly in the Northeast and California where decades of activist regulation/deregulation have already driven up power prices to levels far above the national average. Unlike Germany, however, the US as a whole is undergoing a boom in energy production. And falling wholesale and natural gas prices nationwide are still a very strong disincentive to go off the grid. US utilities have also been far faster than their German counterparts in capturing additional revenue from renewable energy technology. That even applies to the rooftop solar business, which utilities have plenty of options to eventually dominate if it’s indeed worth their while. Finally, despite the best efforts of the Federal Energy Regulatory Commission, US power is nowhere close to being a national market as Germany is. The Southeast, for example, has become America’s new industrial heartland in large part because it’s the Un-Germany. And utilities there are increasingly prosperous for it. In any event, all real industry trends begin on the ground, not from 30,000 feet where most commentators and indeed all too many analysts live. And as always, we’re going to get our best information on how energy demand may eventually affect dividends by the action at the companies themselves. Years from now, if enough things go wrong, the sustained combination of falling demand and declining regulatory support could well threaten some utility stocks’ reliable returns. The reality right now, however, is sector companies’ balance sheets are stronger and operating risk is lower than at any time since the 1960s. Bottom line: It pays to be selective with utility stocks, just as it does in every other sector. And don’t let FirstEnergy’s fate and the hyperbole in its wake scare you out of good stocks.